Always contact your NEWA state coordinator before purchasing a weather station. A weather station at your farm or business improves the precision and accuracy of NEWA tools. Your neighbors and community also benefit when you share weather data through NEWA. Specs listed below include minimum sensor requirements for full functionality with NEWA models and resources. Contact Rainwise, Inc. at 800-762-5723 or visit rainwise.com for more information. 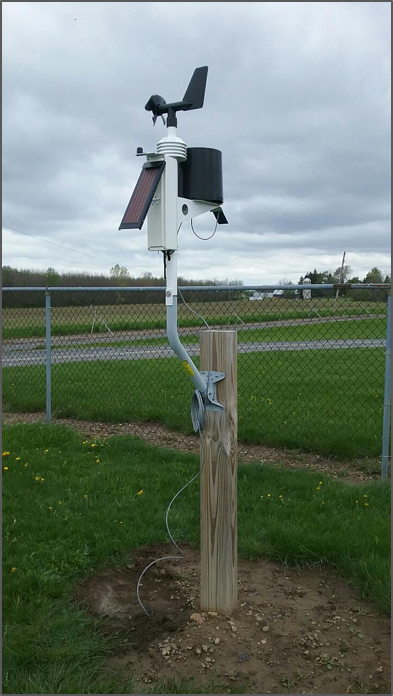 The Rainwise MKIII SP1-LR weather station, located on a Cornell AgriTech @ NYSAES research farm in Geneva, NY. Photo credit: Nicole Mattoon, NYS IPM Program.